Beachrose Ramblings: Madly in Love! No, I haven't been swept off my feet by some dashing stranger, just a beautiful kitchen that stole my heart! From its hand-hewn weathered barn wood beams, to the steel framed window grille and antique iron pendant hung over that simple wood table with industrial steel legs we are talking perfection here dear readers! 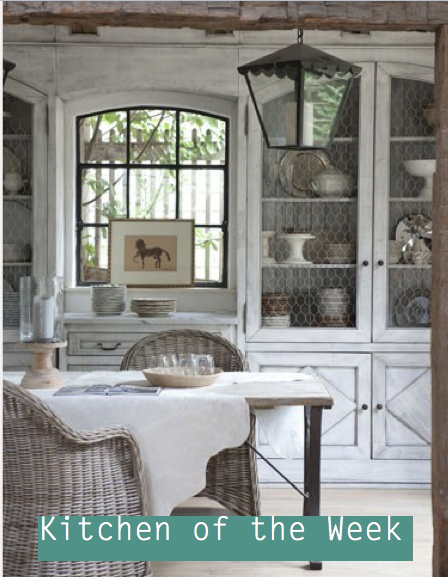 Oh, and don't I just want to sit in those perfectly beautiful weathered gray chairs and gaze at those drop-dead gorgeous pale Parisian gray cabinets with chicken wire doors all day long. I'd never grow tired of this look! Have a wonderful day all! !